Navy blue sleeves cover both arms, from the beginnings of the shoulders to the bottoms of the wrists, on both the inner and outer arm. The sleeves feature a detailed array of geometric patterns that are expertly shaded. Tiny, single birds fly out from the elbow and up the shoulder in this tattoo for men. From the wrist stretches a ghostly, shadowed skull. On the other arm, bright pink ghouls grin and form a floral pattern from wrist to elbow. 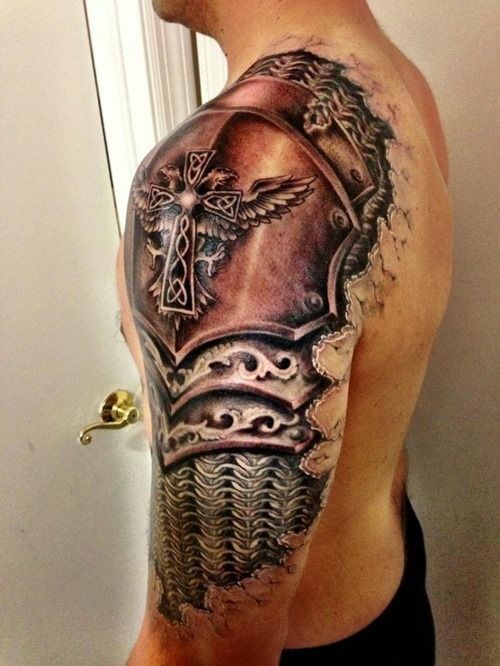 This tattoo idea for men is a prime example of combining darkness and light. From shoulder to wrist, swarm is covered in a sleeve of swirling black clouds dotted with pretty red flowers. Near the wrist, a devilish face with yellow eyes appears amidst the swirls. A beautifully ornate, roman numeral clock sits atop the left shoulder and fades into the top of the left pectoral muscle. The right arm features misty clouds, magical looking bottle, and a detailed circlet atop the inner wrist. The left sleeve features a pirate ship sailing across blood red waves. Beneath the ship, a demon woman dances. The right sleeve is a flurry of American Traditional styled graphics and words. 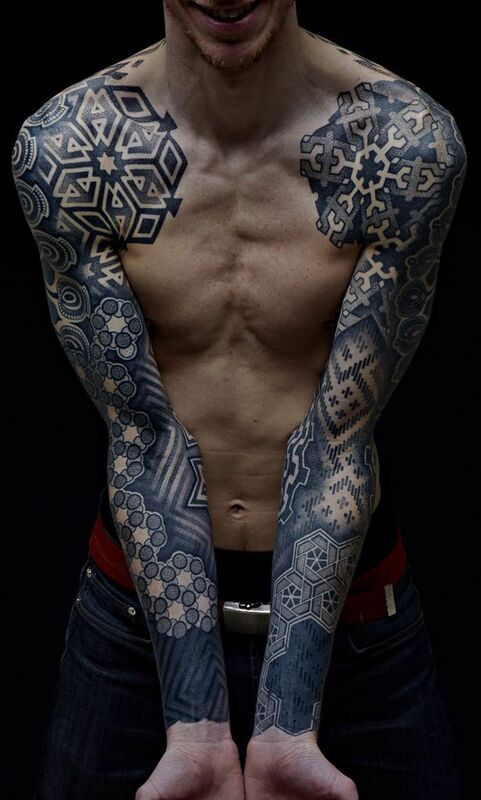 This is a great example of Traditional-styled tattoos for men. 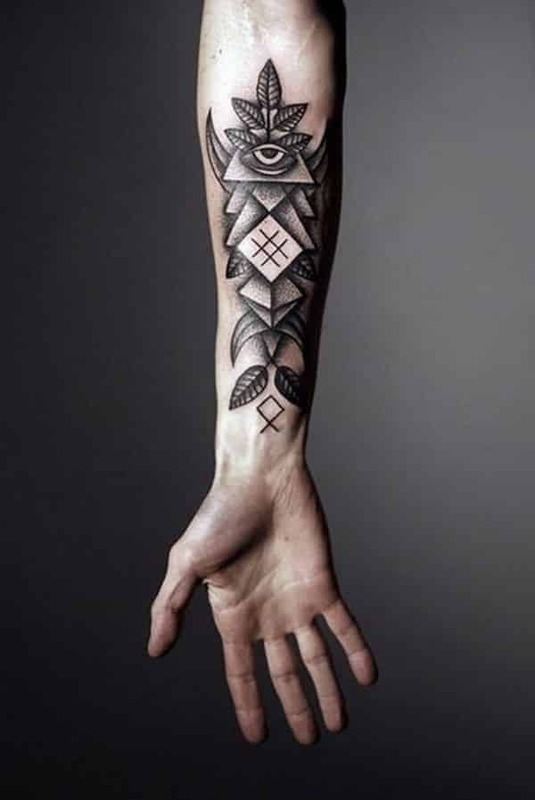 This tattoo for men uses the style of Dotwork and runs up the lower inner arm. It features a stack of geometric triangles topped by a horned eye. Leaves grow from the eye. A line work diamond finishes the tattoo off at the wrist. This American Traditional style tattoo idea for men features two half sleeves. 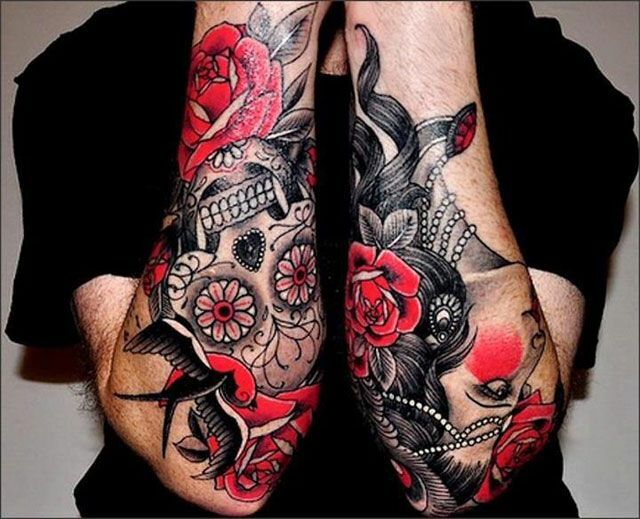 The right arm is adorned with a pretty woman’s profile, surrounded by detailed roses. A Mardi Gras skull is centered on the outer left arm, a bird soaring above it, red roses surrounding its face. The sleeve stretches from just below the elbow all the way onto the pectoral muscle. 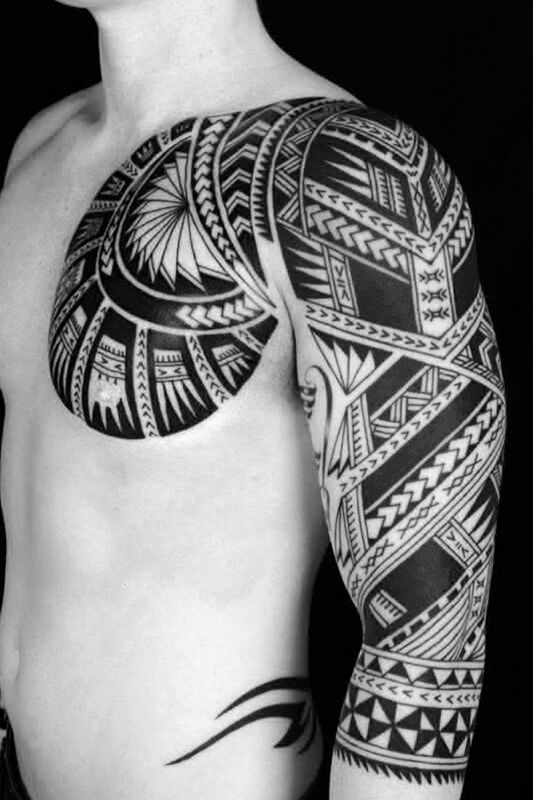 The pattern is a black and white tribal design that is a great inner arm and outer arm tattoo idea for men. It is geometric, asymmetrical, and triangle based. This New School style tattoo features a cross adorned by two eagles with outstretched wings. It is designed to look like shrapnel armor, and appears to be shredding through the outer arm skin and bursting with strength and masculinity. 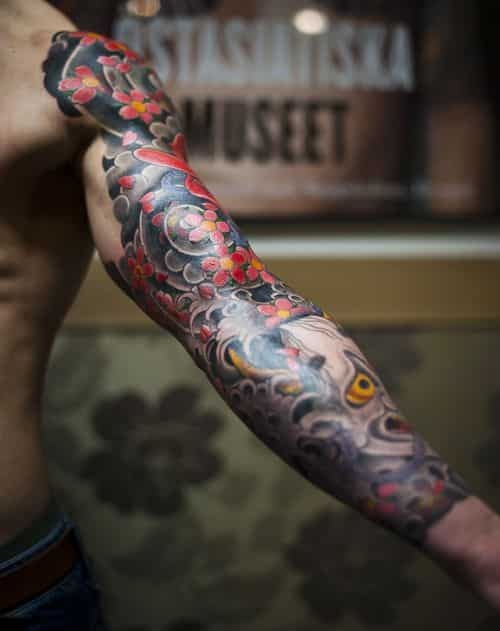 This black ink tattoo is a great example of Blackwork style arm tattoos for men. From shoulder to wrist, asymmetric, tribal-inspired patterns run up and down the arm. The shoulder is topped with a cool swirling decal.